This type of Gears normally used in Sand Drier, Drum Sand Cooler etc, to give rotary motion to shell via Reduction Gear Box and Pinion Arrangement. 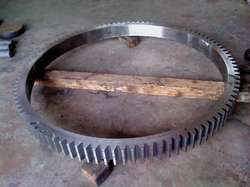 This gear is attached with shell, connected by fasteners. Looking for Aluminium Industry Related Products ?